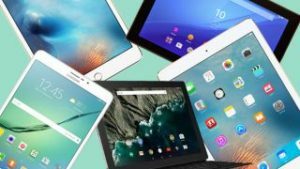 Regardless of whether you’re an Android or Apple or Windows fan, you have plethora of options to choose from while buying your new tablet, so much so that you can easily slip into analysis paralysis! The foremost step that you need to take is to outline the reason behind buying a tablet. Would you like to use it for work or would you want a device which is a bit bigger in size than your smartphone for playing video games? These are few questions which instantly come to your mind while deciding to buy a tablet. There are always brand new tablets coming into the market and hence it is very daunting to keep yourself updated with the new choices that are coming in. What are the best tablets that you can choose to buy in 2017? Here are some that we have shortlisted. Are you looking forward to a cheap tablet just for basic reading or sharing with kids? If answered yes, you may consider buying Amazon’s HD Fire 8. This is an $80 tablet which has built-in Kindle library into the OS of the tablet, thereby making it easily possible to get back to your last read by swiping to the right screen of the home screen. The Fire HD runs on Fire OS software from Amazon, which is based on Android. Hence it also offers some famous apps that are found in Google and Apple’s app stores. The Fire HD is available in 16 GB and 32 GB options and you also get an SD card option where you can expand up to 256 GB. Not only that, you also get Alexa, Amazon’s voice-enabled assistant. Fans of Apple who are only eager to browse the web, play games, run apps don’t require spending more than $600 on a new iPad. There is this $329 tablet which was brought into the market in the month of March and this tablet is more than capable of handling all such tasks. This tablet also has the A9 processor similar to the iPhone 6S and it has got a screen which is as sharp as that of iPad Pro. Although this iPad won’t work with Smart Keyboard or Apple Pencil, you can definitely pair it with a keyboard like those which are made by Belkin and Logitech. Instead of 512 GB storage, you get 128 GB storage and 8 MP camera instead of 12 MP camera of the iPad Pro. However, you can watch Netflix, browse web and check mail. Due to this eye-popping screen and in-built stylus, the Galaxy Tab S3 is now being considered as a perfect candidate for all Android fans. This tablet will make you feel familiar with the other Galaxy phones that you’ve used in the past. The Tab S3 screen utilizes a Super AMOLED panel which makes everything pop with vibrant and bold colors which are only otherwise possible only on the conventional LED screens. If you’re considered about what makes Tab S3 better than Apple and Microsoft’s offerings, it is definitely the stylus which you get. The S Pen does more than only the Surface Pen or the Apple Pencil. It has got several added features of translating text and many more. Therefore, if you’re eager to buy a tablet in 2017, you can certainly make a choice from any of the above mentioned choices. Shop around for the best price so that you get the best buy for your dollars.